The Tower of London is an interesting bit of living history. Though it is no longer a royal residence, and is no longer maintained by the crown, it still plays an active role in the kingdom. The Royal Regiment of Fusiliers is still housed there, as are the Yeomen Warders (better known as ‘Beefeaters‘). Though the tower’s role is largely ceremonial, and it mainly serves as a tourist attraction, it still observes the historical traditions passed down from its origins. For example, every afternoon one can witness the passing of The Word, which is the password required by residents of the castle to enter the grounds after dark. The Tower of London has an extensive history. The White Tower was built by William the Conqueror in 1078. The castle was used as a prison from 1100 to 1952. It was the sight of numerous executions. It still houses the crown jewels, and is now a protected world heritage site. One of the first things we saw on our way to the tower gates was a place where lions used to guard the castle opposite the moat; a clear indication this castle was serious business. We decided to start with a Yeoman Warder guided tour. Our guide was named Shady and he was amazing. Doubly so because it was about a billion degrees outside, by the time you factor in humidity, and his uniform was almost entirely black. Nor was his uniform made from a thin, breathable material. It looked heavy and woolen. I don’t know how he managed not to pass out. In fact, he was a cheerful fellow. He led us around the grounds and told us all the stories about people who died on the tower grounds and the ghosts said to haunt the area. Fun times. 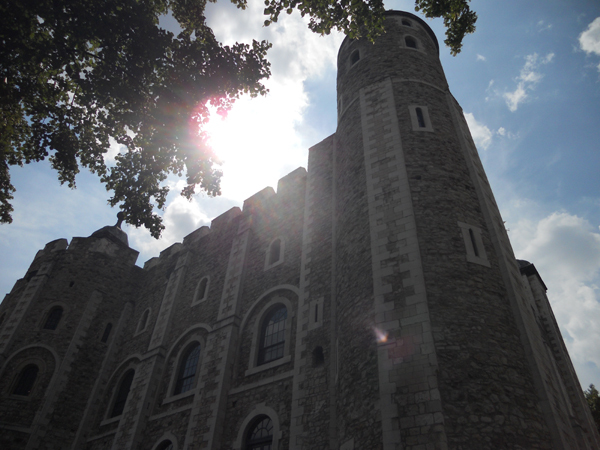 After the tour, we visited the White Tower, one of the site’s most popular attractions. 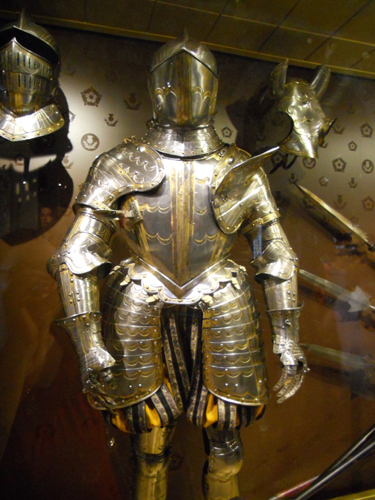 This holds the Hall of Kings, a gallery of former rulers of England and the armor they wore in battle. 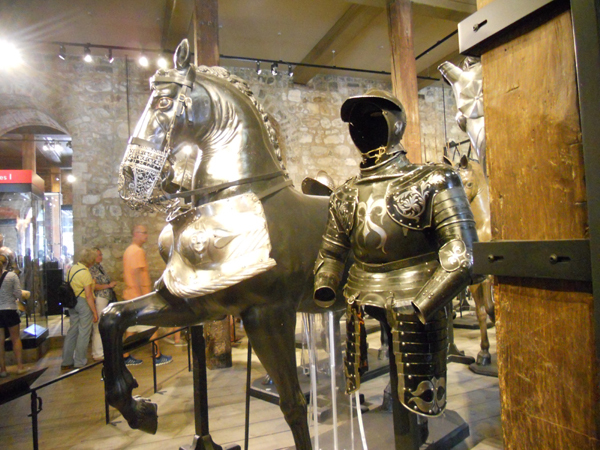 Some of the armor sets are in glass cases, but some are mounted on horse figures with the armor their horses would have worn. In the past, this exhibit served as a reference for foreign visitors. Unfortunately, that information wasn’t overly accurate. Even today there are pieces marked as ‘unknown owner’, though they have been historically presented as belonging to someone else. In addition to armor, there are weapons from all over the world. 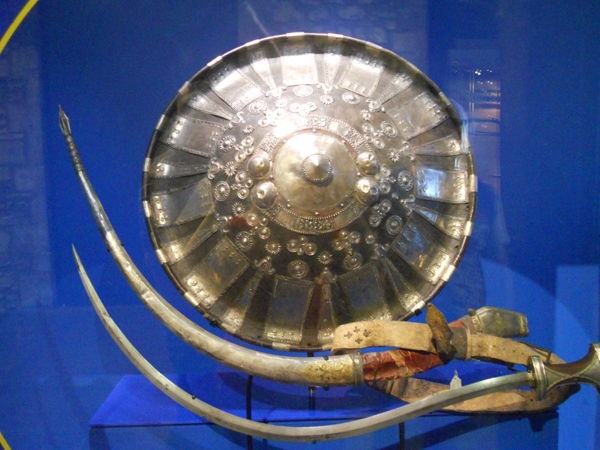 Some belonged to previous rulers of England, heroes who served in England’s military throughout history, and others were gifts from foreign rulers to the kings or lords to add to their collections. Today it’s a collection of England’s military history. There’s even a section on trade and British coins. When we finished in the White Tower, we walked a circuit of the wall surrounding the castle. From there, we got a good look at the line leading into the building where the royal jewels are housed. We decided to skip the jewels, because the line was insane. There are several galleries and informational areas set up in the towers linked by the wall. But it was interesting to look down on both the castle and the city from the area where guard patrols would have walked during earlier time periods. Of course now, most of the city towers above the castle walls. The most interesting stop along our wall walk was the medieval portion of the castle. 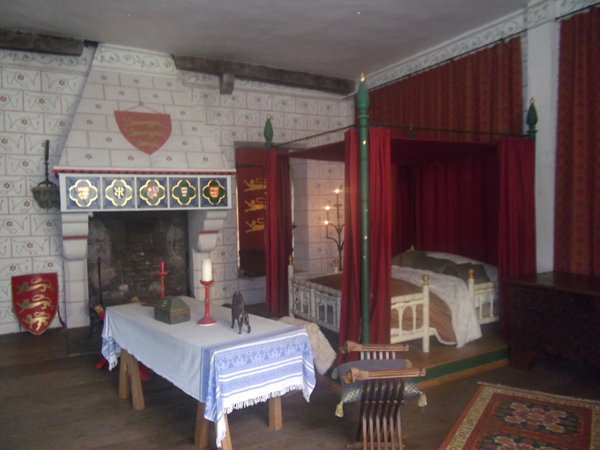 This shows a portion of the original castle restored to what it would have looked like in medieval times, including the King’s bedroom. It was most interesting because, until this point, all of the medieval castles we had seen were either in ruins, or had been updated to more modern castles before falling into ruin. It was something of a surreal experience, like being transported back in time. The Tower of London also houses the last of the genuine Tudor period buildings in the city (the rest have all burned down). During our visit, they were setting up the Blood Swept Lands and Seas of Red art installation meant to commemorate the centenary of the outbreak of World War I. 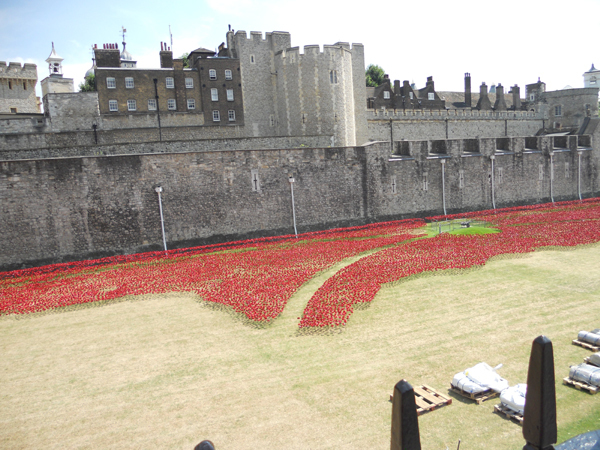 It consisted of 888,246 ceramic red poppies, each intended to represent one British or Colonial serviceman killed in the War. Not all of the poppies were in place during our visit, but they were still an impressive sight.